Can”t remotely login to your shiney, new MySQL server due “Can’t get hostname for your address” or “Can’t get hostname for your address”. Another random MySQL error message. Simply put, if you look in the logs, MySQL cannot lookup your IP/hostname. Its that simple. Is your DNS broke? Or just on a Local Area Network with no DNS anyway? Thats it. One line. Its rubbish. Here’s mine to help you along the way. Its got some decent logging set, some decent cache and memory options for a shared server set and some helpful security settings enabled. # Reduced wait_timeout to prevent idle clients holding connections. # Reduced it to 32 to prevent memory hogging. # Reduced it by checking current size of *.MYI files. # log slow queries is a must. A small annoyance of mine is on local development servers, I can’t login to the MySQL server as root. Screw all these AJAXified, buzz-wordified MySQL monitors. I’m old school. I use the fantastic mytop tool Jeremy Zawodny created 9 years ago. 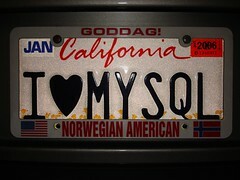 MySQL has always lacked the sophisticated profiling tools shipped with proprietary databases like SQL Server, etc. MySQL developers have largely depended on EXPLAIN for tuning queries. The SHOW PROFILE patch by Jeremy Cole was introduced in the MySQL Community version 5.0.37 and it provided much more insight into where the query spends its time. However, to take advantage of this feature, MySQL developers were supposed to switch on profiling, run their queries and then filter the profiling data from a table that contained the profiling results of the last few profiled queries. A lot of manual book-keeping is required to take advantage of this powerful feature. In an ideal situation, the MySQL developer should execute the queries and the profiling info should be available along with the result-set. Unfortunately, none of the MySQL client tools (desktop or web-based) provide intrinsic support for this feature. Watch the Screencast on Query Profiler. phpBB stores its IP addresses in a funky format. They’re useless to the human eye! This code will convert all know IPs from a selected user (In my case 51). A recent project I was working on cause me to stumble over the Yahoo Term Extractor. Something I had previously never heard of – it is a very underrated tool.